I know that nearly all of the viral website owners are facing continuous rejection from Facebook for creating Ads for the viral link. I am also facing these issue, getting disapproval for nearly all of newly created ads and also old Ads. According to the above reply from Facebook, we will face disapproval if we include Google Ads on our landing page. So that we need to restructure our landing page to be in compliance with the Facebook policy. 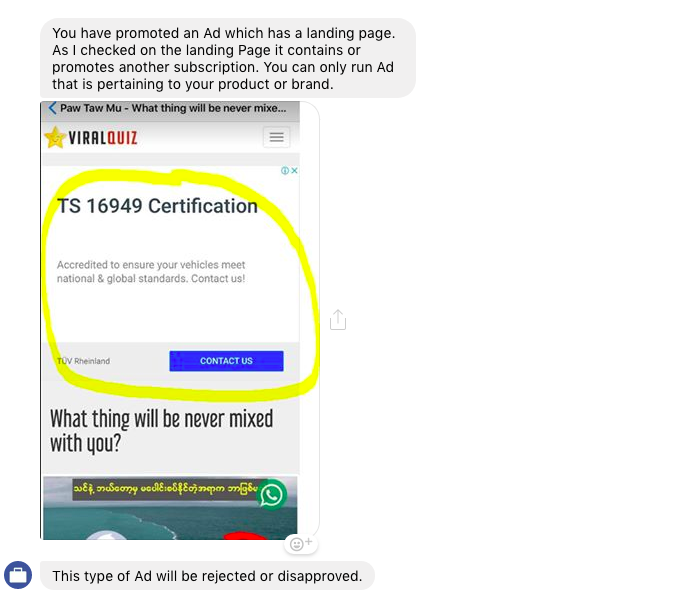 If you check the famous quiz website “Kueez” Facebook page, you will notice that they can create many Facebook Ads for their website. When I check their landing page, I noticed that there are no Ads on their landing page. Ads only appear after user play the quiz. 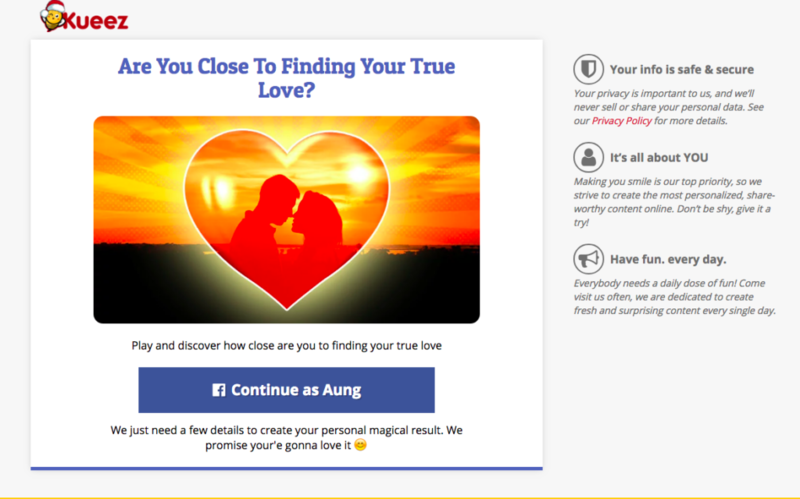 So I think that we need to re-structure our landing page similar to Kueez. Any thoughts on this finding? Frankly, I have suffered a lot in the past two months. Your publications in this blog encouraged me to enter the area of the Quizzes..So I bought STANDARD package of Nametest Apps..the Delivery was in less than a week..But getting the permissions from Facebook was very difficult..It took me over a month to get it..It was then designed around 12 quizzes..But When I was finished I was surprised by the problem you were in..Any ads from facebook has approved..Now I do not know what to do. I’ve lost a lot of time and money and I have not gotten a result..Everything I have( VPS, Nametestapps Platform (Standard Package), Business manager (Verified account), Facebook Permissions, quizzes..). What do you suggest to me, sir? On the other hand, I think the only solution is to design a clean landing page (without adsense unit) for each quizzes, And publish them by facebook ads. And The landing page turned the visitor to the quizzes page on the your website. In the end if you advise me something, I will be grateful to you. First of all, Please stay calm and don’t be too stressed about it. We all suffered this situation. As far as I know, nametestapps is redesigning their landing page to get Facebook approval. I have regular contact with them and already talked about landing page issue. I hope that they will come up with the new landing page soon. At the moment, what I am doing is creating a Facebook Ads to home page instead of specific quiz page. Your home page should be cleared from any Ads. You will get approval for this Facebook Ads. From this Ads, you can drive traffic to your homepage and then user will play the quizzes on the Home page. I will not give you alot of revenue, but so far quite ok for me. And you should invest in Facebook page, what I mean is creating engaging posts (not quiz post) regularly on your page. It will help you to get traffic when you share quiz url on this page. Thank you for your reply, i hope that from the team of nametestapps for redesigning their landing page to get Facebook approval..on the other side, I may have found an alternative temporary solution: You can design a landing page like “kueez”..and When you press the “Start button”, The app link will open on the same page and if the site speed is good the visitor will not feel anything..All of this can be easily done through this site “getresponse.com” + the Landing pages can also be linked to your domain name by add an CName to your Domain config, The page will appear to be raised on your site..But the site service is paid subscription..But the good is that there is a free trial period of 30 days..I think it is sufficient until the nametestapps team complete his work.. If there is a new solution in the future, we hope you will participate with us. Thanks for your valuable information bro, I will try it. I will also keep updating about nametestapps progress. Hi, can you tellme how can i can contact the Facebook Ads policy help team with live chat support ?